Bernard M. Sklar, M.D., M.S., a psychiatrist in Berkeley, Calif., provides this Annotated List of Online Continuing Medical Education (CME). 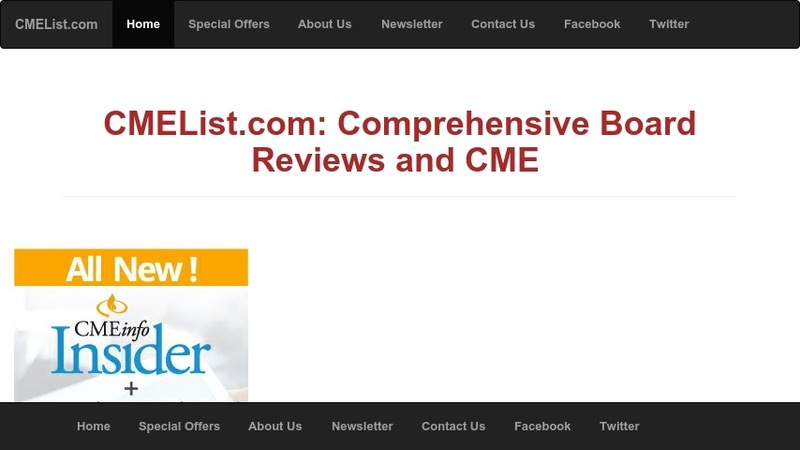 Online CME allows physicians to earn CME credits over the Internet. The instruction might involve reading an online journal article, listening to or viewing a lecture, playing a game, answering quiz questions, enrolling in correspondence courses, or having an opportunity to make choices according to the clinical presentation using a case-based interactive format. This website provides a description and link to each website, with a total of over 16,000 activities and over 26,000 credit-hours offered through more than 325 online CME sites. The listing can be browsed alphabetically by the first letter of the site name, or by dominant medical specialty or medical topic. Although most of the courses are fee-based, a number of the courses are available free of charge. The bottom of the website provides information on how the websites were selected, as well as a link to Sklar's master's thesis, "The Current Status of Online Continuing Medical Education," and PowerPoint presentations that provide an introduction to Online Continuing Medical Education and updates its current status.